It has been suggested that this article be merged with Housing development. (Discuss) Proposed since December 2017. A housing estate in West Kensington, with many rows of similar terraced flats. A housing estate (or sometimes housing complex) is a group of homes and other buildings built together as a single development. The exact form may vary from country to country. Accordingly, a housing estate is usually built by a single contractor, with only a few styles of house or building design, so they tend to be uniform in appearance. In the British Isles, the term is quite broad, and can include anything from high rise government-subsidised housing, right through to more upmarket, developer-led suburban tract housing. In major Asian cities such as Shanghai, Kuala Lumpur, Hong Kong, Shenzhen, Singapore and Seoul, an estate may range from detached houses to high density tower blocks with or without commercial facilities; in Europe and America, these may take the form of town housing, or the older-style rows of terraced houses associated with the industrial revolution, detached or semi-detached houses with small plots of land around them forming gardens, and are frequently without commercial facilities. Housing estates are the usual form of residential design used in new towns, where estates are designed as an autonomous suburb, centred on a small commercial centre. Such estates are usually designed to minimise through-traffic flows, and to provide recreational space in the form of parks and greens. The use of the term may[original research?] have arisen from an area of housing being built on what had been a country estate as towns and cities expanded in and after the 19th century. It was in use by 1901. Reduction of the phrase to mere "estate" is common in the United Kingdom and Ireland (especially when preceded by the specific estate name), but not in the United States. Given the security situation and Power shortages in the South Asia 'Gated communities' with Self power generation and modern amenities (24-hour armed security, schools, hospitals, a fire department, retail shopping, restaurants and entertainment centres ) such as Bahria Town and DHA have been developed in all major cities Pakistan. Bahria Town is largest private housing society in Asia. Bahria has been featured by international magazines and news agencies such as GlobalPost, Newsweek, Los Angeles Times and Emirates 24/7, referred to as the prosperous face of Pakistan. Gated communities in Pakistan are targeted towards upper middle class and upper class, and are mostly immune from problems of law enforcement. Broadwater Farm Estate in London. Civil unrest in 1985 left two dead. In the United Kingdom and the Republic of Ireland, housing estates have become prevalent since World War II, as a more affluent population demanded larger and more widely spaced houses coupled with the increase of car usage for which terraced streets were unsuitable. Housing estates were produced by either local corporations or by private developers. The former tended to be a means of producing public housing leading to monotenure estates full of council houses often known as "council estates". The latter can refer to higher end tract housing for the middle class and even upper middle class. In addition, the problems incurred by the early attempts at high density tower-block housing turned people away from this style of living. The resulting demand for land has seen many towns and cities increase enormously in size for only moderate increases in population. This has been largely at the expense of rural and greenfield land. Recently, there has been some effort to address this problem by banning the development of out-of-town commercial developments, and encouraging the reuse of brownfield or previously developed sites for residential building. Nevertheless, the demand for housing continues to rise, and in the UK at least has precipitated a significant housing crisis. 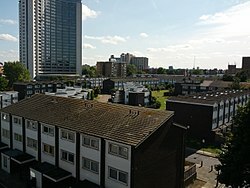 Renowned housing estates in the capital include the Andover Estate in Holloway, North London, the aforementioned Broadwater Farm estate situated in Tottenham, the Heygate Estate in Walworth, South East London and the Alton Estate in Roehampton, South West London. In the UK, some of the post war new towns were constructed en masse from housing estates rather than as organic growth from a population centre. In the former Czechoslovakia (now Czech Republic and Slovakia) during the Communist era a construction of large housing estates (Czech: sídliště, Slovak: sídlisko) was an important part of then urban planning. The government wanted to provide large quantities of affordable housing and to slash costs by employing uniform designs over the whole country. They also sought to foster a "collectivistic nature" in the people. Large housing estates of concrete panel buildings (panelák) now dominate the suburbs of Prague, Bratislava and other towns. 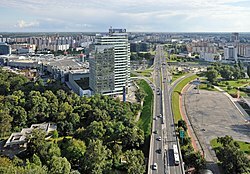 The largest such suburb in the former Czechoslovakia and central Europe can be found in Petržalka (population about 130,000), a part of the Slovak capital of Bratislava. Due to dense population and government control of land use, the most common form of residential housing in Hong Kong is the high-rise housing estate, which may be publicly owned, privately owned, or semi-private. Due to the oligopoly of real-estate developers in the territory, and the economies of scale of mass developments, there is the tendency of new private tower block developments with 10 to over 100 towers, ranging from 30-to-70-storeys high. Public housing provides affordable homes for those on low incomes, with rents which are heavily subsidised, financed by financial activities such as rents and charges collected from car parks and shops within or near the estates. They may vary in scale, and are usually located in the remote or less accessible parts of the territory, but urban expansion has put some of them in the heart of the urban area. Although some units are destined exclusively for rental, some of the flats within each development are earmarked for sale at prices which are lower than for private developments. A private housing estate is usually characterised by a cluster of high-rise buildings, often with a shopping centre or market of its own in the case of larger developments. Mei Foo Sun Chuen, built by Mobil, is the earliest (1965) and largest (99 blocks) example of its kind. Since the mid-1990s, private developers have been incorporating leisure facilities which incorporate clubhouse facilities: namely swimming pools, tennis courts, function rooms in their more up-market developments. The most recent examples would also be equipped with cinemas, dance studios, cigar-rooms. There is currently some controversy over the "wall effect" caused by uniform high-rise developments which adversely impact air circulation. In-fill developments will tend to be done by smaller developers with less capital. These will be smaller in scale, and less prone to the wall effect. Forms of housing estates in the United States include tract housing, apartment complexes, and housing projects. ^ "housing estate". Oxford English Dictionary (3rd ed.). Oxford University Press. September 2005. (Subscription or UK public library membership required.). Note the example in a 1923 book by Francis Longstreth Thompson, Site planning in practice; an investigation of the principles of housing estate development. ^ "Asia's Largest Real Estate Builder Bahria Town Website". Retrieved 2013-04-23. ^ Chan, Karen (30 May 1996). "Nan Fung to build $1b flats in Tsuen Wan". The Standard. Archived from the original on 17 December 2007. Retrieved 22 March 2007. ^ Yung, Chester (21 December 2006). "`Asia's walled city' leaves - residents longing for air". The Standard. Archived from the original on 17 December 2007. Retrieved 21 March 2007.